Getting Involved at Victory Kitchen is fun and easy. There are endless ways to help. 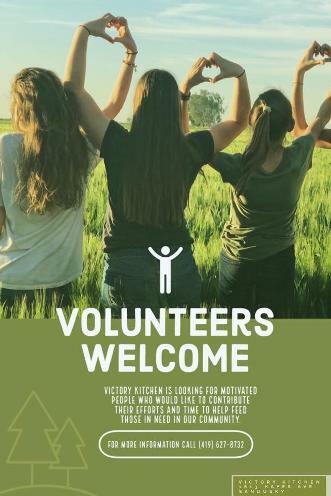 Victory Kitchen NEEDS everyone in the community to pitch in and do a little bit to ensure that the enormous job of feeding the hungry in our area is completed. There is no job and no donation that is too little to help. Can drive - set up a container at your next scheduled event for people to place their canned food donation. Make sure to let people know ahead of time that the container will be there. Victory Kitchen uses literally thousands of cans of food every year. Car Washes and Bake Sales-tried and true, these two events are proven money makers. Your organization can host an event to raise money to help Victory Kitchen keep their doors open. Monetary donations help pay for utility costs. Pancake breakfasts or Spaghetti Dinners-great for youth groups, women's groups, Boy Scout or Girl Scout troops. We once had a single boy scout host a dinner to raise money for Victory Kitchen in order to earn a merit badge. Victory Kitchen often has to buy meat, because not enough is donated. Recycle aluminum Cans -Go green and help Victory Kitchen at the same time. Have your group collect aluminum cans from home, their friends, family and neighbors. Take them all to the recycling center and donate the proceeds to Victory Kitchen. Victory Kitchen has to buy coffee cups, plates, forks, and napkins because not enough is donated to meet the growing need. Donate your Time-There is nothing like hands on experience to show you just how big the need is. Call Victory Kitchen to set up a time that you or your group can volunteer to help feed the hungry.